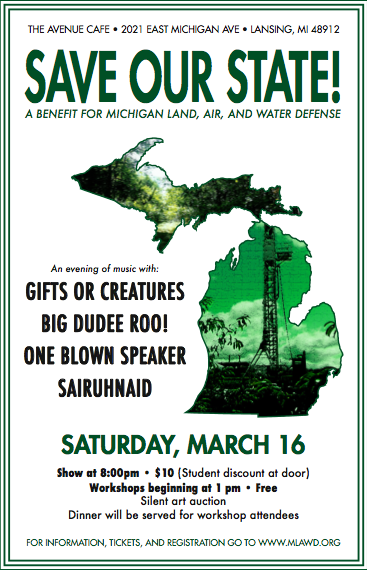 Michigan Land Air Water Defense (MLAWD) and Clean Water Action present “Save Our State!” – a full day of workshops geared toward engaging the public in the fight to protect Michigan’s fresh water, followed by an evening of music from Michigan bands (8-midnight) committed to building consciousness and community. Lead organizers Sarah Barker (MLAWD) and Kate Holloway (Clean Water Action) hope to inspire Lansing’s diverse population to educate themselves on recent developments in horizontal hydraulic fracturing and the State’s leasing of public land for oil and gas development. The process of horizontal slick water hydraulic fracturing uses 5-7 million gallons of fresh water for each and every well that is completed – water that is never returned to the hydro-cycle. According to the DEQ, up to 500 wells will be permitted in our state this year. In 2012, the Michigan Department of Natural Resources auctioned off the mineral rights to 108,000 acres of our State Forest areas in May and another 193,000 acres in October, to private energy companies for oil and gas extraction. Others have filed legal action against the Michigan Department of Environmental Quality for failing to have a protocol (or even full disclosure) for chemical contamination. This drilling process is also largely EXEMPT from regulation by the Federal EPA, a result of the Energy Policy Act of 2005. – and a special guest from Pennsylvania: Restoration Ecologist Kevin Heatley, who will educate workshop attendees on Pennsylvania’s ongoing fight against fracking. Workshops are free of charge, and Registration is encouraged. (Register at: www.MLAWD.org.) Dinner will be served for workshop attendees who register. The Concert begins at 8 pm. Tickets are $10 and funds will go to MLAWD to help cover legal expenses.